Tulsi is a newly available botanical medicine from the Ayurvedic tradition of India. 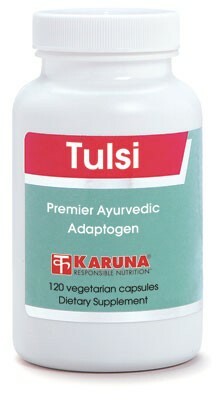 Classified as an adaptogenic herb similar to the ginsengs and astralagus, Tulsi has numerous positive effects on physiology established by animal research, including support for physical performance, resistance to stress, blood sugar regulation, protection against environmental chemicals, and numerous other health effects. Human trials demonstrate the promise of Tulsi for supporting normal glucose and lipid metabolism, respiratory function, energy production, joint function, and immune system activity. Tulsi is an adaptogenic herb, meaning that it supports normalization of physiological states and resistance to physical, chemical, or biological stress (Indian J Exp Biol 2000;38:119-28; Zeitschrift fur Phytotherapie 1992;13: 42-54). Animal research finding benefits to physical endurance and performance has led to human clinical trials demonstrating Tulsi to facilitate optimal energy production (J Biol Chem Sci 1995;14:184-7). Animal research demonstrating blood sugar regulation properties has led to human clinical trials finding Tulsi helps maintain normal blood sugar and blood lipids, and prevents undesirable glycosylation of proteins (Int J Clin Pharmacol Ther 1996;34: 406-9; J Nutr Environ Med 1997;7: 113-18). Effects on supporting respiratory function found in animal research have led to human clinical trials wherein Tulsi helped maintain healthy pulmonary function, respiratory airway flow, and eosinophil counts (Sacitra Ayurveda 1983;35:665-68). • Human studies have also demonstrated immune system support (Ann Nat Acad Ind Med 1986;2:14-26; Proc 10th Int Cong Pharmacol Sydney Aust 1987;1:265), joint function optimization (Med Surg 1981;8:21) and gastroprotective effects for Tulsi (J Res Ind Med 1970; 4:238-9). Suggested use for adults: 2-4 capsules early morning and afternoon or as directed.